Costanza really loves Italian cuisine. So much so, he could probably eat it every day. Actually, that is what I've been doing for the last 2 meals leading up to this one. Pronto for lunch, Charlie's Little Italian for late night and then La Pentola for dinner the next night. 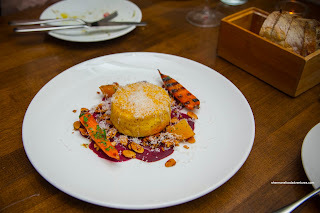 We were actually at La Pentola to celebrate Costanza's birthday and it was an alternative to their sister restaurant, La Quercia. We didn't want to drive out to Alma nor be squeezed into their narrow dining room. We really didn't have to look at their menu as we had the Alla Famiglia 7-course meal in our sights. Things started off with a bang as the impressive-looking Antipasti Board hit the table. 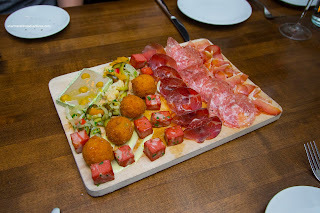 From right-to-left, it included Speck, Salami, Bresaola, Mortadella, Arancini Carbonara with artichoke aioli, Pickled Veggies and Duck Parfait. The best item was the duck parfait that was encrusted with sage. It was creamy, aromatic and appealingly gamy. The cold temperature was also just right as it hit our palates. To further balance off the flavours, the orange puree on top added acidity and a hit of citrusy sweetness. The house-made fried mortadella was also a hit as it had a firm rebound while being salty in an appetizing manner. 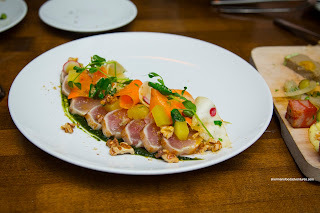 Next was the Seared Tuna served with compressed apple, walnuts, shaved carrots and parsnips with a parsley sauce. Buttery while still meaty, the tuna was perfectly seared. There was a slight hint of the sea surrounded by natural sweetness. I found the parsley sauce did not taste as expected. It was still bright, but the flavours were more sweet and savoury than the bitterness often associated with parsley. The apples added a concentrated sugariness while the veggies added both crunch and acidity. Arriving on 2 separate plates, the Parmesan Souffle was very familiar as I've had this at La Quercia in past meals. Well, this one didn't disappoint as it was exactly how I remembered it. It was super fluffy and creamy with the unmistakable aged cheese nutty taste. We liked how it was only purposefully salty. Underneath, the the pickled beets added some necessary acidity and sweetness while the pickled mustard seeds offered up a tangy bitterness. On the side, the balsamic-glazed carrots were both sweet and tangy while the roasted pumpkin seeds provided a nice crunch. Other than the antipasti board, the best dish of the night was definitely the Agnolotti del Plin. 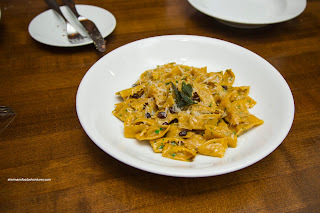 It was comprised of duck confit stuffed pasta and marsala currants in a brown butter sage sauce. The freshly-made pasta was thin and chewy while fully stuffed with tender shredded duck. There was an impactful amount of gamy duckiness combined with an aggressive use of salt. As for the brown butter, there was just enough to coat each piece with a nutty silkiness. The sage was there, but not overpowering while the currants added a wine-sweetness. 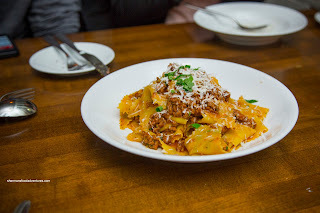 Our next pasta dish was the Maltagliati with lamb ragu, mint and pecorino cheese. We found the pasta sheets to be expertly prepared as it rode the fine line between chewy and tender. It was well-seasoned which kinda of worked against itself as the lamb ragu was overly salty. This may have contributed to the fact that there was minimal gaminess until the finish with each bite. Although lean, the lamb was sufficiently tender with some meatiness. The ragu did exhibit some rich flavours due to the long and slow-cooking process. 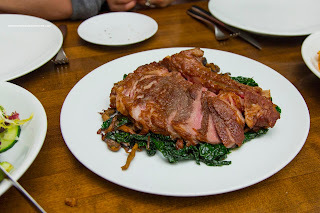 Onto the meat course, we were served a large whole Bone-In Ribeye with sauteed kale and mushrooms. It was prepared a nice medium-rare with a few medium spots at the ends of the steak. Suffice to say, with the fat content, the meat was full-flavoured with plenty of umaminess. It was a bit over-salted, but at the same time, it meant the meat flavours were heightened. As with this cut of meat, the steak was generally tender with an appealing chewiness. Underneath, I found the kale and mushrooms to be rather greasy and over-seasoned. 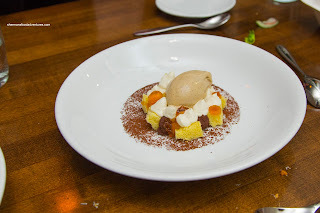 For dessert, we had the Deconstructed Tiramisu with sponge cake, amaretto jelly, espresso ice cream, chocolate ganache and marscapone cream. Although this was a pleasant dessert, it did not match the other dishes in terms of enjoyment. We found the sponge cake to be dry while the chocolate ganache was too sweet, chalky and dry. However, the espresso ice cream was very good with a good balance of bitterness with sweetness. It was also creamy and smooth. Despite the dessert, we thought the meal as a whole was pretty good albeit a bit salty. 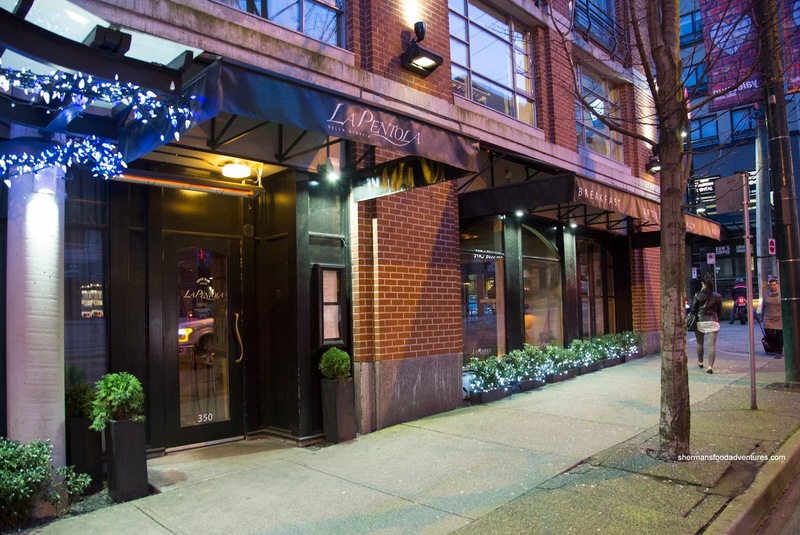 We liked the low-key atmosphere and the equally unpretentious service. I think you eat out too much though, you have a post almost every day! Do keep it up.